Click for a larger cover image. The longitude in the summit coordinates for Quandary Peak given on pages 64 and 67 is off by a degree. Both references should be 39.3972° -106.1063°. The coordinates for 9T1 - The Mount Massive Trailhead on page 100 are a little off. The correct coordinates for 9T1 are 39.1518° -106.4191°. are a little off. The correct coordinates for 9T2 are 39.1532° -106.4632°. on page 107 is off by a hundredth of a degree. The correct coordinates for 10T1 are 39.1520° -106.4102°. on page 107 are a little off. The correct coordinates for 10T2 are 39.1504° -106.4555°. 18T3 - Blank Gulch Trailhead - page 164. The Forest Service has created a fancy new trailhead at Blank Gulch. The new trailhead is complete with a restroom and a no camping regulation. 20T2 - the Tobin Creek Trailhead. While this trailhead is in the Rio Grande National Forest, the access to it described on page 203 is on private property, and this access is limited to those who have permission from the landowners. The description on page 203 is intended for those with permission. If you don’t have permission and want to access Route 20R6 - the Southwest Ridge of Little Bear, go up the Lake Como Road to the boundary of the Rio Grande National Forest at 8,800 feet, then hike south and east to Tobin Creek. The legend for the map’s line styles was inadvertently left out. The solid lines are for standard routes, which are always route 1 in the text. Variations have a unique, dedicated, non-solid line style throughout the book. Extra Credits have a unique, dedicated, non-solid line style throughout the book. Alternate routes have a different, non-solid line style for each peak in a group. The USGS has changed datums, and announced new altitudes for all of Colorado’s Fourteeners. The USGS adjusted the elevations for all Fourteeners upwards from three to seven feet. The peaks have not instantly gained height, since this is just a mathematical adjustment. For a list of the old and new elevations, see Gerry’s Fourteener List. In the first printing of the Second Edition, there were some errors on the overview map on page xxvi. This was corrected in later printings. The Leave No Trace Organization has rearranged some of their verbiage, and added new guidelines, which are respect wildlife and be considerate of others that you meet on the trail. See www.lnt.org for more information. The approach to the Stevens Gulch Trailhead described on page 17 is no longer “passable for most passenger cars.” This road (FR 189) has become rougher in recent years, and it has been re-classified as “High Clearance Vehicles Only.” There is a sign at the bottom of the hill advising motorists of this fact. Heed it. The Guanella Pass Road has been upgraded and paved over the summit of the pass. There are now two new parking lots near the summit of the pass, one on the east side of the road just north of the pass and one on the west side of the road just west of the pass. The Guanella Pass Trailhead on Page 31 has moved from the old parking lot right on the pass to the new parking lot on the east side of the road. This change reduces the round-trip elevation gain from this trailhead by 60 feet. Arrive early at this trailhead, for once the parking lots are full, you may not be allowed to hike toward Bierstadt. The line for Route 3.13, Bierstadt’s West Slopes Route, on Map 3 on page 32 is slightly off. The printed line directly up the slope is the old, disused trail. 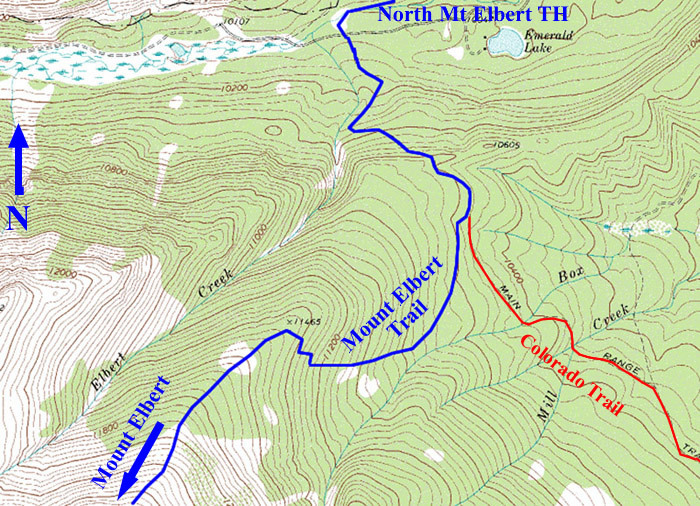 The new, improved CFI trail is a little to the north of the printed line, and the new trail reaches the crest of Bierstadt’s northwest ridge. Under Pikes Peak on Page 48, the contact number for Barr Camp Reservations (719) 630-3934 is no longer valid. The current contact is www.barrcamp.com. The trail system east of the Crags Campground Trailhead on page 45 has been improved. There is now a signed trail junction and a bridge across the creek to reach the southern drainage that leads to Devil’s Playground. The Monte Cristo Trailhead described on page 55 is no longer in use since the trailhead and first part of Quandary’s East Slopes Route above it is on private property. To accommodate hikers on this popular Fourteener, the Forest Service has constructed a new trailhead nearby, and rerouted the first part of the East Slopes Route. I call the new trailhead the Lower McCullough Gulch Trailhead. To reach it from Colorado 9, go west on Summit County 850 for 0.1 mile, turn north (right) onto Summit County 851 and go 1.0 mile to the new trailhead. A trail goes southwest from the new trailhead to join the original route at the base of Quandary’s lower east slopes. Access to Lincoln, Democrat and Bross is currently restricted. Old mining claims, long strips of private land, crisscross the slopes of these peaks, and the current owners fear that hikers might fall into old mine shafts. The state legislature passed a new statute that limits land owner’s liability in cases like this, but the routes remained restricted in 2008. Access to these peaks is being worked on, and hopefully there will be a coherent solution for the 2009 season. See http://www.fs.fed.us/r2/psicc/news/2006/nr_sopa_040306.fourteeneraccess.shtml for contacts and more information. Route 7.4 on Mount Sherman that originates at the Sacramento Creek Trailhead, which is described on page 73 and goes southwest above Sacramento Creek, is no longer accessible. It is blocked by private property that is guarded by a sanctimonious landowner. The USFS has not been able to help the public gain access to Sacramento Creek. Do not use the Sacramento Creek Trailhead. The Little Sacramento Trailhead, described on page 71, is on private property. Do not use the Little Sacramento Trailhead to gain access to Route 7.3 on Mount Sherman. At this point, there is no public access to Mount Sherman’s Route 7.3. The Mount Sherman Map on page 72 has an error. The 4WD parking above the Fourmile Creek Trailhead is at 12,520 feet, not 11,680 feet as printed. Map 8’s dashed line for Routes 8.2, 8.3 and 8.4 on Mount of the Holy Cross on Page 77 is slightly incorrect near Lake Patricia. Instead of going along Lake Patricia’s west shore as shown, the trail stays 200 yards west of the lake. The Eagle County Sheriff’s office and local search and rescue teams have responded to many rescue calls in recent years on the Mount of the Holy Cross. They have asked me to better educate hikers about the special hazards found on this peak, and I am happy to do that. Holy Cross has three hazards that are unique to this peak. First, is the fact that when climbing the standard North Ridge Route, you must go over Half Moon Pass, then descend 970 vertical feet to East Cross Creek, then climb the mountain. The hidden hazard is that you must reclimb the 970 feet to Half Moon Pass on your return trip. This extra climb pushes the total ascent on the North Ridge Route to over 5,600 feet. This is more gain than the standard Keyhole Route on Longs Peak, which many people consider to be a very arduous climb. The second unique hazard on Holy Cross is at the point where the standard North Face Route reaches the lower north ridge near 11,500 feet. On descent, many hikers reach this point, and continue straight down the now broad ridge instead of turning east (right) for the descent back into the East Cross Creek drainage. This is a bad error, since it is a significant departure from the route, and the error does not fail safe. If you persist in this erroneous descent, you will encounter increasingly steep and rough terrain. Eventually, you will reach the Cross Creek valley, which does have a trail in it, but this trail will not lead you back to the Halfmoon Trailhead. The third and most poignant hazard is not on the standard North Ridge Route, but on the much longer and more exposed Halo Ridge Route. One party of two found the length of this route to be too much for their conditioning, and made the choice to separate in the saddle between 13,831-foot Holy Cross Ridge and Holy Cross. The man went to the summit of Holy Cross while the woman agreed to contour below the summit of Holy Cross near the 13,800-foot level, and meet the man on the upper part of the North Ridge Route, which was their intended descent route. In spite of an enormous, lengthy search, the woman was never seen again. My personal opinion about what happened is that the woman started the contour and found it to be much longer and rougher than expected. In fact, this contour may be more difficult than going over the summit. In general, it is very difficult to hold a strict contour, especially if you are tired. My theory is that the woman lost altitude during her attempt to contour, then ran into a gully, that could easily have drawn her even lower in an attempt to cross the gully. At this point she was in the middle of the large west face of Holy Cross, and badly off route. By choice or chance, she must have descended into the trees, where the terrain steepens. There are small cliffs hidden in these trees, and any stumble or fall, could have quickly left her in a life-threatening situation. Now, years later, she has still never been found. This sad story should be sufficient motivation for you to approach this mountain properly conditioned and equipped. Mount Massive’s East Slopes Route 9.1 has been rerouted slightly. The trail has been moved to the south to avoid a sensitive wetland area near 13,200 feet. Mount Massive’s Southwest Slopes Route 9.3 has been rerouted significantly. The trail has been moved to the north to avoid an erosion gully near 13,200 feet. The North Mount Elbert Trailhead on page 93 is 0.4 mile east of the Mount Massive Trailhead at mile 6.6, not mile 6.9 as stated. The North Mount Elbert Trailhead is 0.1 mile east of the Elbert Creek Campground. The dashed line for La Plata’s Route 11.3 on Map 11 on page 100 is wrong in three places. First, the 2WD West Winfield Trailhead should be at Winfield instead of 0.6 mile up the now-rougher road. Second, the marked position for the 4WD parking is slightly off. The correct position is at 10,900 feet just east of the creek 0.2 mile east of the creek coming from the basin between Sayers Benchmark and La Plata. Third, the trail in the basin does not climb to 13,000 feet in the basin before climbing west to the ridge at 13,200 feet. In reality, it climbs to 12,100 feet in the basin, then climbs west-northwest to the Sayers Benchmark-La Plata saddle at 12,780 feet. From there, the route climbs northeast on the west side of the ridge. In the description on page 101 for La Plata’s Route 11.1 the Northwest Ridge, the “log bridge” a half a mile from the Lake Creek Trailhead has been replaced by a steel bridge. More importantly, the text “After crossing the bridge, go north (left)” should read “After crossing the bridge, go south (right).” If you turn left, you will reach private property. Do not trespass. Route 12.1, the standard route on Huron, is now a Colorado Fourteener Initiative Trail, which is Class 1 all the way to the summit. The location of the 4WD parking spot above the Rockdale Trailhead is mis-marked on Map 12 on page 104. The correct position is in a meadow at 10,895 feet, which is 0.25 mile south of the marked position. The location of the 4WD parking spot above the Rockdale Trailhead is mis-marked on Map 13 on page 108. The correct position is in a meadow at 10,895 feet, which is 0.25 mile south of the marked position. The position of the Clohesy Lake 4WD Parking on Map 13 on page 108 is slightly off. This long route provides an escape from the 4WD road. Start at the Browns Creek Trailhead at 8,920 feet and follow the Browns Lake Trail 1.3 miles west to the Colorado Trail. At this point Little Browns Creek is just 150 yards to the south. In a counter-intuitive move, turn north (right) and follow the Colorado Trail 0.5 mile north to the signed Little Browns Creek Trail, which is just south of the point where the Colorado Trail crosses a small creek. The Little Browns Creek Trail starts as an old rocky road that climbs southwest up a hill. The USFS is discouraging use of the Jennings Creek Trailhead on page 137. They prefer that people climb Tabeguache by climbing Shavano from the east, traversing to Tabeguache, then returning the same way. This is an unreasonable itinerary for a standard route to Tabeguache that exposes people to a much greater lightning hazard. The summit of Kit Carson Mountain was on private property, but it became National Forest land when the Great Sand Dunes National Park land acquisition was finished. On Kit Carson’s East Ridge Route 19.17 on page 164, the referenced gully used to reach the connecting ridge between Humboldt and the Bears’s Playground is 0.7 mile farther to the west than shown on Map 19 on page 148. You can traverse the ridge as shown, but it is rough in spots. Hiking access above the Cottonwood Creek Trailhead described on page 146 is now restricted. As of summer, 2009, the USFS has closed the South Colony Lakes Road at the Rainbow Trail about halfway up the road. They have constructed a new trailhead at the new road closure. This closure adds 5 miles roundtrip to all routes from the South Colony Trailhead. The western approach to Culebra Peak is now owned by the Cielo Vista Ranch. They do accept some reservations each year for climbs of Culebra and neighboring peaks. They have been charging a fee of $100 per day per person for climbs of Culebra. Contact the ranch at cielovistaranch@hillranch.com or 254-897-7872 or 254-897-9537 for more information. On Route 24.1, the standard route up Maroon Peak, the point where the route leaves the Maroon Creek Trail and starts steeply up the hill is now graced with an evident use trail. This point is 100 yards north of the creek crossing at 10,500 feet. There is a nice campsite between the use trail and the creek crossing. There is no sign indicating the beginning of the use trail, just a cairn. On Route 24.4, the standard route up North Maroon Peak, the important use trail that takes you from the Buckskin Pass Trail into the basin below the northeast ridge leaves the Buckskin Pass Trail 0.6 mile above the trail junction near Crater Lake in a meadow at 10,800 feet. This is a little farther and higher than the printed 0.5 mile and 10,700 feet. There is no sign indicating the beginning of the use trail, just a caring. On Route 24.7, the standard route up Pyramid Peak, the Fourteener Initiative has constructed a good approach trail leading from the Maroon Creek Trail into Pyramid’s north basin. As printed, the approach trail begins in a rocky area 1.1 miles above Maroon Lake at 10,120 feet. There is no sign indicating the beginning of the use trail, just a caring. There is a second start for the approach trail a few hundred yards farther west, which you would use if you were camped near Crater Lake. There is no sign indicating the beginning of the approach trail, just a caring. The Fourteener Initiative has constructed a new trail that climbs through the basin southeast of Wetterhorn. The new trail is 200 yards south of the position marked on Map 27 on page 223. Also, there is a well-defined use trail that climbs over the top of Point 13,117. Route 28.10 on Handies west slopes, described on page 240, is now a good trail all the way to the summit. The route line for this route on Map 28 on page 234 is a little off. The new trail is south of the printed line, and even though this route is slightly longer, it is best to stay on the trail to avoid damaging the loose slopes. Also, Variation 28.10V is best avoided for the same reason. The Durango-Silverton Railroad now charges $62 roundtrip no matter where you get on or off. No exceptions. You can still hand the conductor $31 cash for a one-way ride out from Needleton in either direction. Gerry has a new DVD to the 3 Fourteeners in this group, Sunlight, Windom, and Eolus. See Chicago Basin and its Fabulous Fourteeners for details. Approach 31.A1 - the Silver Pick Basin Approach on page 264 has changed. After a period of closure, there is now a new Forest Service trailhead 1.3 miles above the old Silver Pick Trailhead referenced on page 261. The Silver Pick Basin Approach referenced on page 264 is similar, but has changed slightly to avoid the remaining private property in the basin. The new approach route is well signed. In the description for the Navajo Lake and Kilpacker Basin Trailheads on page 263, the distance from the Rico Post Office to the turn onto the Dunton Road is 6.5 miles, not 9.5 miles. The West Ridge of El Diente, Route 31.7, is very loose, and some people have found it to be much harder than their expectations. Return to the Fourteener Book’s Main Menu.